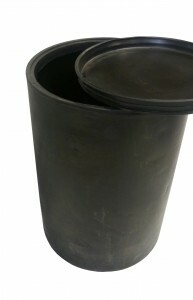 JFC manufacture 200L polyethylene drums suitable for storing liquids, pastes and granules. These drums have a full top opening complete with lid and lever action closing ring. They are finished with a smooth inner surface interior for ease of cleaning. Customer logos, or branding can be prominently displayed on the product if required.